The word ‘geometry’ comes form the Greek words 'geo', meaning the 'earth, and 'metrein', meaning 'to measure'. Euclid defined a point, a line, and a plane, the definitions are not accepted by mathematicians. Therefore, these terms are now taken as undefined. Axioms or postulates are the assumptions which are obvious universal truths. They are not proved. 1. Things which are equal to the same thing are equal to one another. 2. The whole is greater than the part. 3. If equals are added to equals, the wholes are equal. 4. Things which are halves of the same things are equal to one another. 6. Things which coincide with one another are equal to one another. 7. If equals are subtracted from equals, the remainders are equal. Postulate 1 : A straight line may be drawn from any one point to any other point. Postulate 2 : A terminated line can be produced indefinitely. 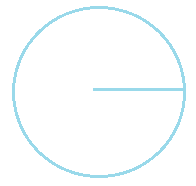 Postulate 3 : A circle can be drawn with any centre and any radius. Postulate 4 : All right angles are equal to one another. Postulate 5 : If a straight line falling on two straight lines makes the interior angles on the same side of it taken together less than two right angles, then the two straight lines, if produced indefinitely, meet on that side on which the sum of angles is less than two right angles. Theorems are statements which are proved, using definitions, axioms, previously proved statements and deductive reasoning.